The above pictures are of the case front, logo, the back side and the insides (with drive/PSU cage in, and with them swung open). 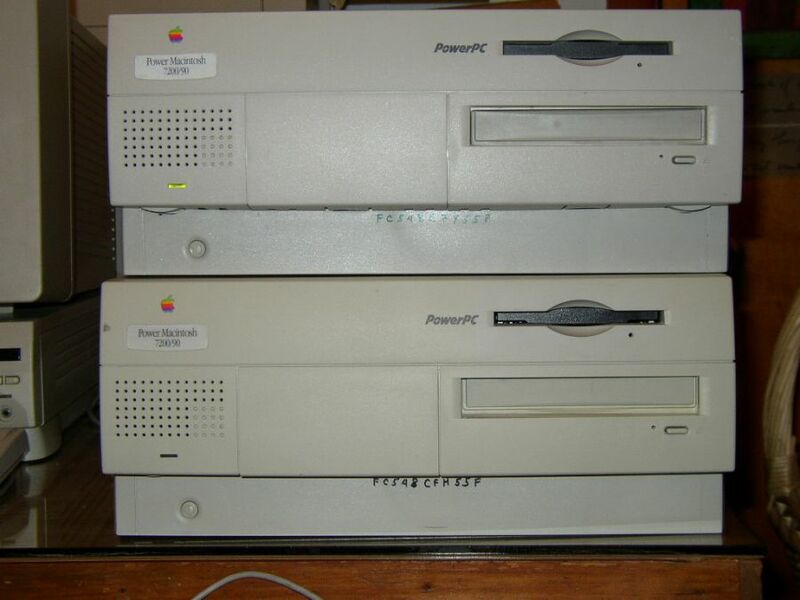 The PowerMacintosh 7200 was introduced in late 1995 with 75mHz and 90mHz models, and later in '96 a 120mHz version. The 7200 model was the first with the case design it, and the 7500, employs. 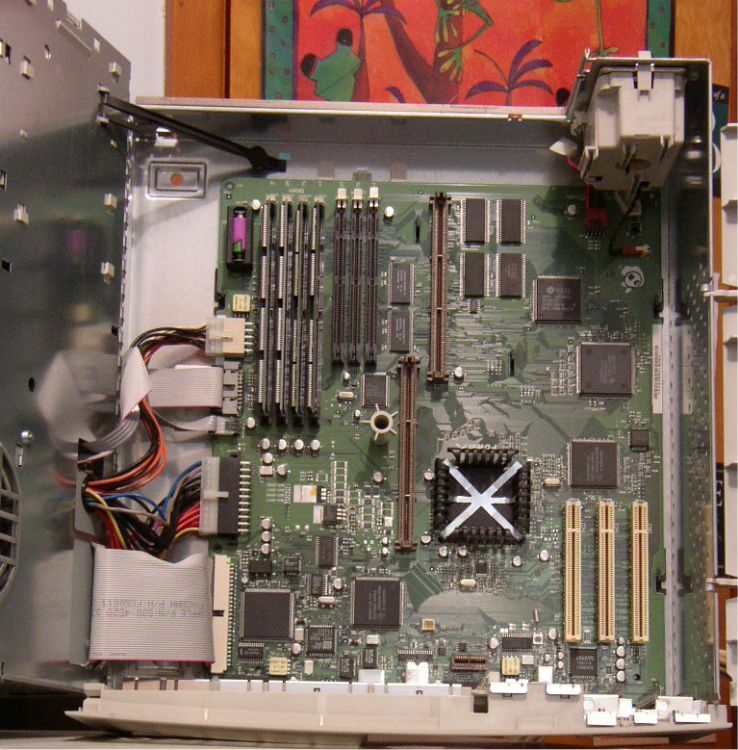 One of the things I keep saying about Macs is how nice they are to pull apart - and the 7200 is no exception with the outer shell sliding off from two button presses, the drives and PSU are mounted on a plate which lifts up and out on a long hinge to give full access to the whole motherboard. Very nice. My unit has a 90mHz 601 PowerPC processor and runs a minimal MacOS 7.6 installation using up only 9 Megs of disk space. The remaining diskspace (Roughly 1 Gig) is used by a Debian Linux install. I had much fun learning how to install Deb Linux on PMac, and I've found documentation is kinda poor. Click here to find out what I did. 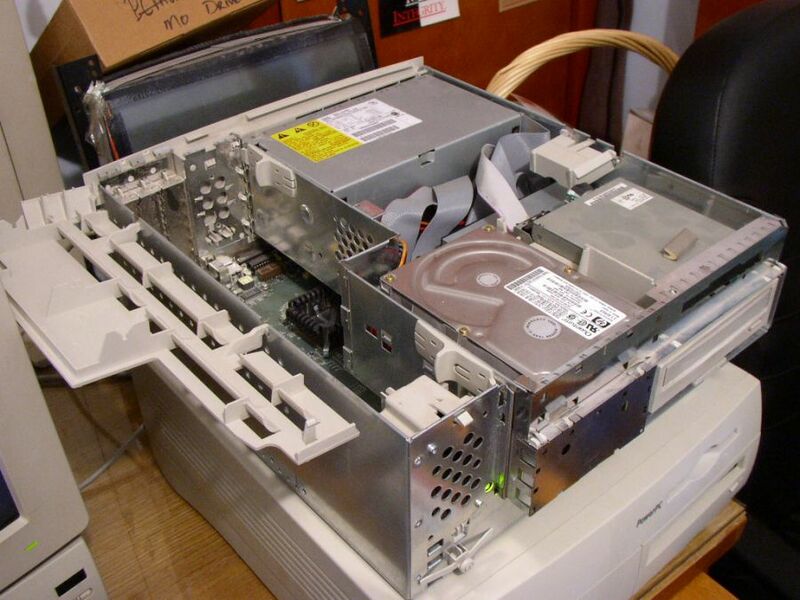 The 7200 comes with the usual DB25 SCSI port, DB15 Mac Video, serial, ADB, AppleTalk and sound ports, plus onboard AAUI and RJ45 ethernet ports. The unit can be upgraded to 256MB of RAM (168 pin DIMMs), with optional L2 cache and video RAM and also has 3 full-length PCI slots.